For those who have progressed from a beginner and want to become a good (or even exceptional) drummer. v Clear simple, easy-to-read notation. v Progress chart to fill in. v Every exercise demonstrated on the CD. v Covers blues, rock, funk, Latin, and swing. can play along, utilising all that has been learned. This book is fantastic! Packed full of rudiments, grooves, drum tips and 'play along' tracks of rock, funk, latin and swing on a really well-produced CD. What's great Ð and a brilliant idea Ð is seeing the stuff written out in drum notation, then hearing it (played by author Steve Laffy, an ace drummer). It does make it easier to get to grips with the tough stuff. I've learnt so much from this book, and not only built on what I'd achieved so far, but also been led to try out new grooves. It's truly inspirational and makes you want to get at your kit right away. I'd recommend this book to all drummers of all standards and give it 5 stars with no hesitation. Starts off with the basics to continue on from the first book in the series (check that out as well! ), but I've been using this book for about three years now and some off the stuff i can still variate and learn from, and the play-along pieces at the end are still a challenge after all this time. 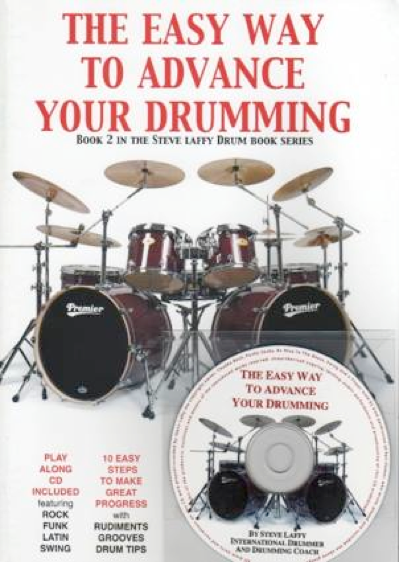 Good all rounder book for sure, teaching you awesome advancements in drumming in all aspects of the kit. If you're looking for techniques on improving your drumming, including in some more unusual areas, this is the book to get.